Artist L.R. Montgomery and his paintings of the Spokane River. The Spokane River is more than just a subject for artist L.R. Montgomery: It's an inspiration. "It has so much history and so many spiritual callings," Montgomery says. "It's always changing. You'll never see the same piece of water there again. "You never run out of things to paint at the river." The local landscape painter grew up in Spokane the son of a machinist, and one could say he produces his work with the efficiency of a machine. Montgomery probably completes a couple hundred paintings each year, colorful and impressionistic depictions of Inland Northwest nature that range from 5-by-7-inch postcards to much larger canvases. He typically times himself, he says: He'll decide, for instance, that this is going to be a "one-hour painting," and once he reaches the 60-minute mark, then the painting is finished. "A lot of times, your subconscious takes over and you can get it done," he explains. Montgomery has been painting professionally for about 30 years, having dabbled in woodblock prints, drawings, etchings and sculpture along the way. He mostly works on canvas, but he sometimes uses old door panels, painting the surface black and then creating his landscapes on top of that. He and his wife Carole sell his work out of their South Hill home — "she's the left brain of our business," Montgomery says — and prices for his pieces range from $50 to $5,000. Sitting in a rocking chair in his living room, Montgomery is surrounded by his own art: dozens of paintings hanging on and leaning against the walls, most of them depictions of the Spokane River from every angle imaginable. He's now 70, though he doesn't feel it. "There's your chronological age, and then there's the age you think you are," he explains, "and I think I'm 12." Montgomery works from his home studio or in his driveway, but much of the time he actually takes a portable easel out into nature — in People's Park, on the Little Spokane, in the Turnbull wildlife preserve — and simply paints what he sees. He has a "viewfinder," a rectangular cardboard frame broken into quadrants, and he holds it up and captures what appears inside its border. People frequently stop and talk to him while he's working, he says, and he often sells paintings on the spot. It's a story his customers can tell their friends, Montgomery explains: It's not merely a piece of art they found hanging in a gallery. "I'll be at Dishman Hills," Montgomery says, "and somebody will come along and they'll say, 'What are you doing?' And I'll say, 'Well, I'm painting.' And they say, 'Why are you doing that?' And it's because I can, and I don't know how to do anything else. "A lot of artists don't know how to stick out their hand and meet their customer, but I love meeting these people." The river, Montgomery says, has always held a fascination for him. He began his career as a wildlife painter, but his focus eventually shifted to more pastoral subjects, and the river just naturally became a centerpiece. "People are awed by it," Montgomery says. "You can't hardly go anywhere where you don't have to cross the river." 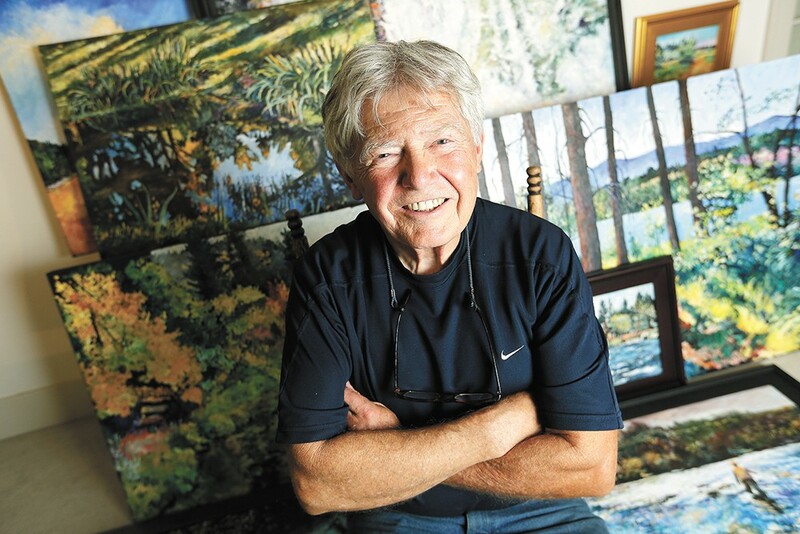 Montgomery was named the resident artist of Dishman Hills, and a large collection of his paintings of the conservancy area was recently featured at Dodson's Jewelers. The sales from that show benefited the Dishman Hills, and Montgomery says he wants his paintings to impart a message of respect and love for the river. The original print version of this article was headlined "Painting on the Water"